This page shows piano and treble clef diagrams of all melodic minor scales, starting from note C.
All keys are shown, including the commonly used 12 keys of the Circle of fifths diagram, and other theoretical (ie. not practically useable) keys. Theoretical keys are clearly marked (they would have double sharps or flats in the key signature), and alternative enharmonic keys that sound the same are suggested in each case. 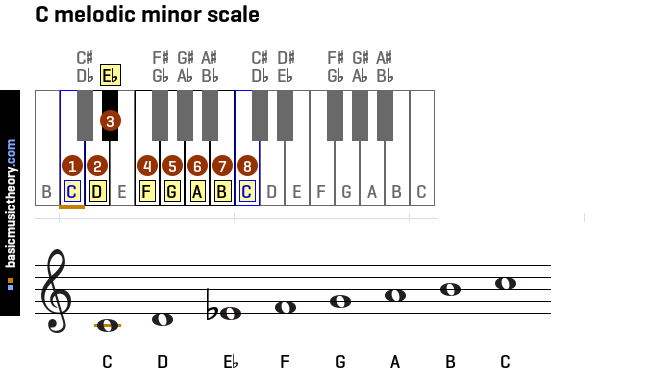 The C melodic minor scale has 1 flat. This is a commonly used minor scale key - C minor on circle of 5ths. 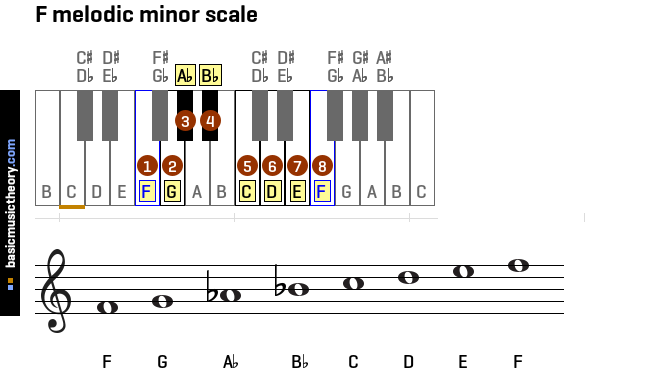 The C-sharp melodic minor scale has 6 sharps. This is a commonly used minor scale key - C# minor on circle of 5ths. 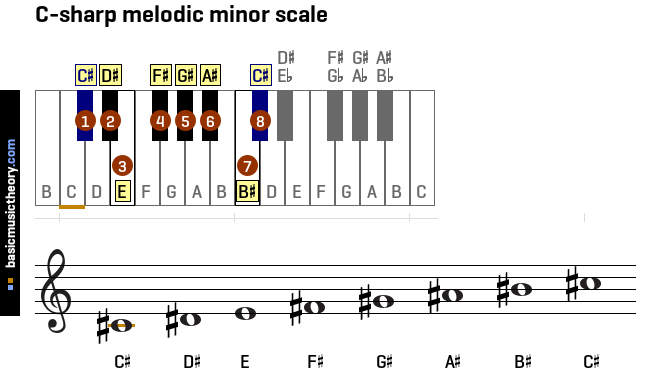 The D-flat melodic minor scale has 6 flats. Warning: The D-flat key is a theoretical minor scale key. The C# melodic minor scale contains the same note pitches, is easier to work with, and is a direct replacement. The D melodic minor scale has 1 sharp. This is a commonly used minor scale key - D minor on circle of 5ths. 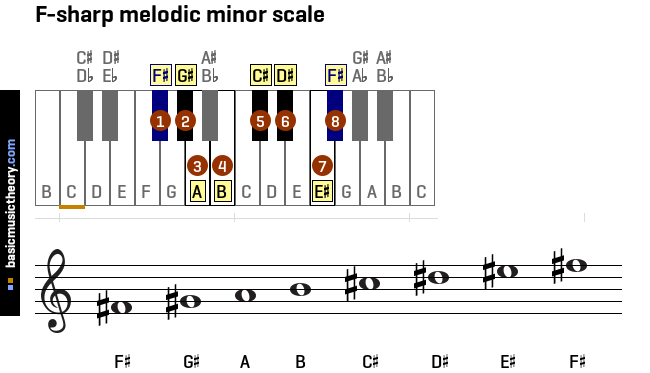 The D-sharp melodic minor scale has 6 sharps, 1 double-sharp. This is a commonly used minor scale key - D# minor on circle of 5ths. The E-flat melodic minor scale has 4 flats. 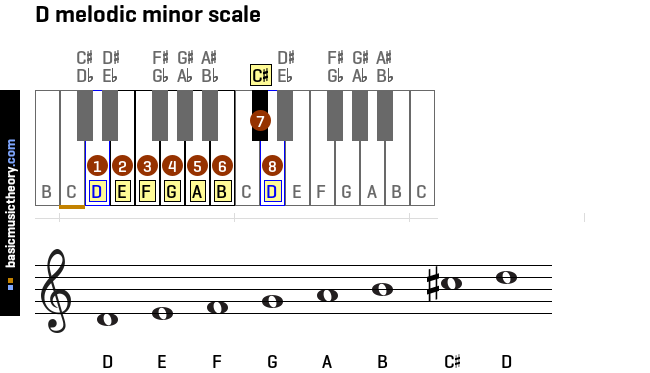 This is a commonly used minor scale key - Eb minor on circle of 5ths. 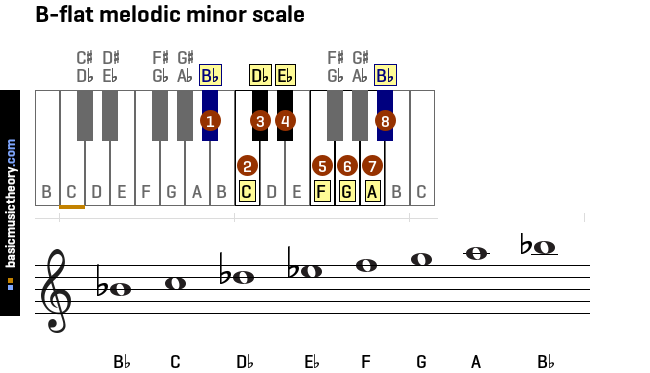 The E melodic minor scale has 3 sharps. This is a commonly used minor scale key - E minor on circle of 5ths. 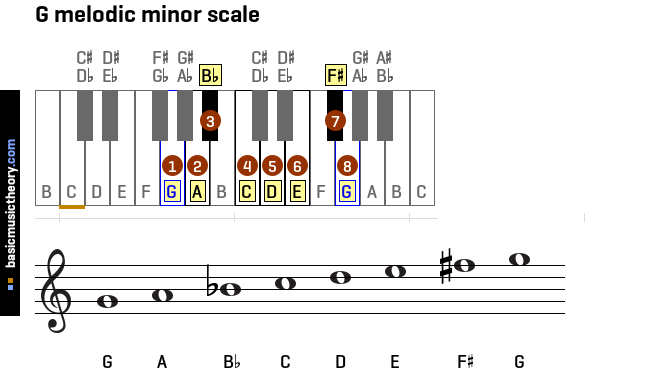 The E-sharp melodic minor scale has 4 sharps, 3 double-sharps. 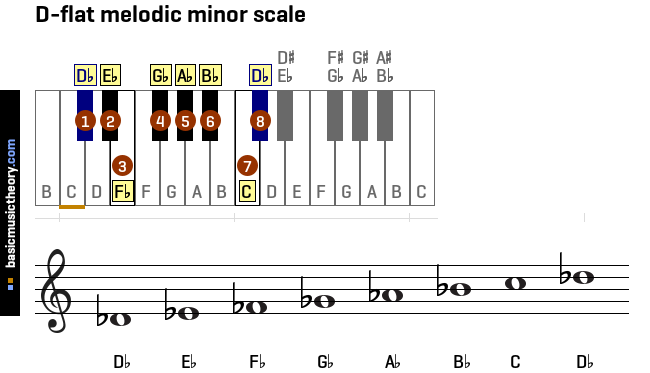 Warning: The E-sharp key is a theoretical minor scale key. 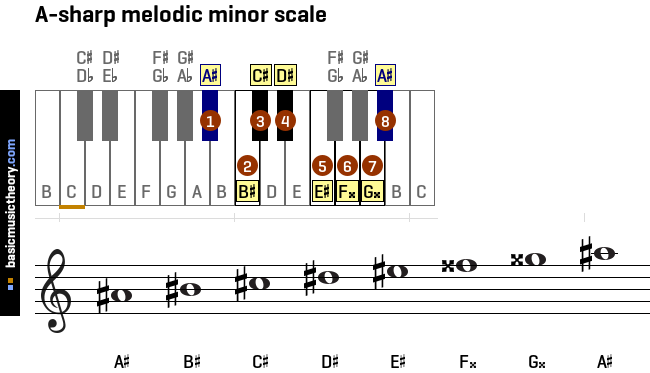 The F melodic minor scale contains the same note pitches, is easier to work with, and is a direct replacement. The F-flat melodic minor scale has 2 double-flats, 5 flats. Warning: The F-flat key is a theoretical minor scale key. 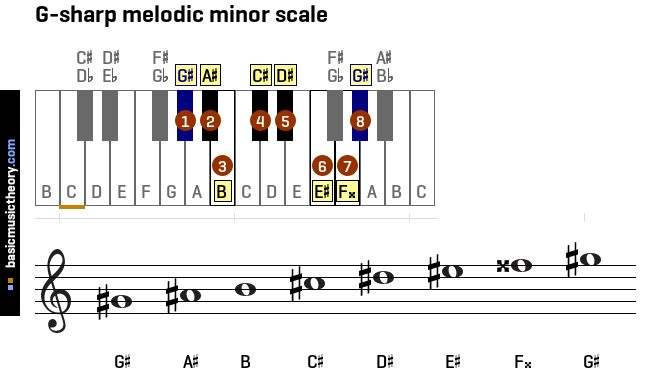 The E melodic minor scale contains the same note pitches, is easier to work with, and is a direct replacement. 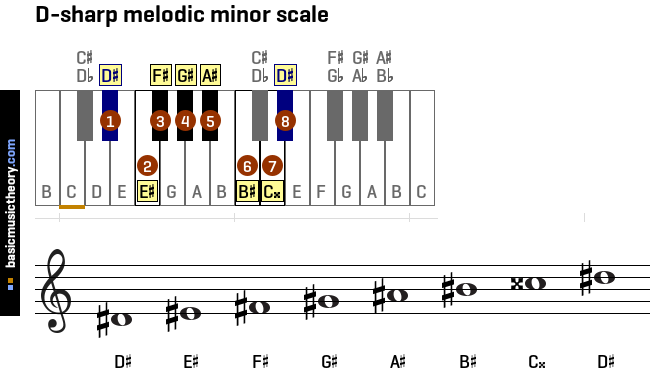 The F melodic minor scale has 2 flats. This is a commonly used minor scale key - F minor on circle of 5ths. 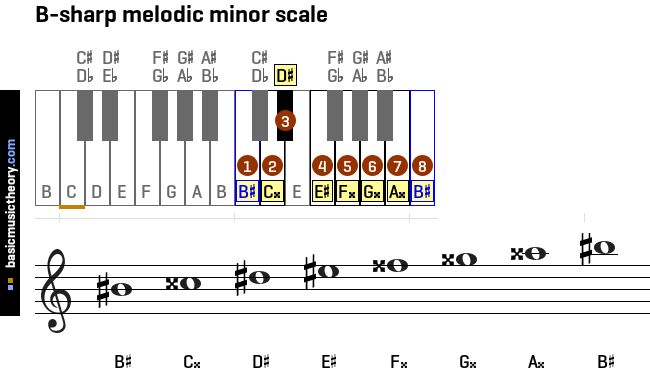 The F-sharp melodic minor scale has 5 sharps. 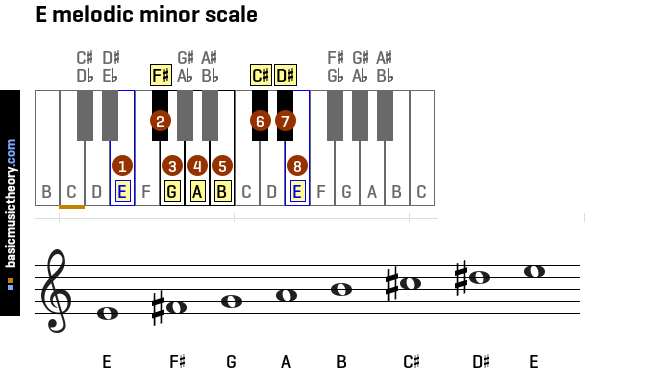 This is a commonly used minor scale key - F# minor on circle of 5ths. Warning: The G-flat key is a theoretical minor scale key. The F# melodic minor scale contains the same note pitches, is easier to work with, and is a direct replacement. 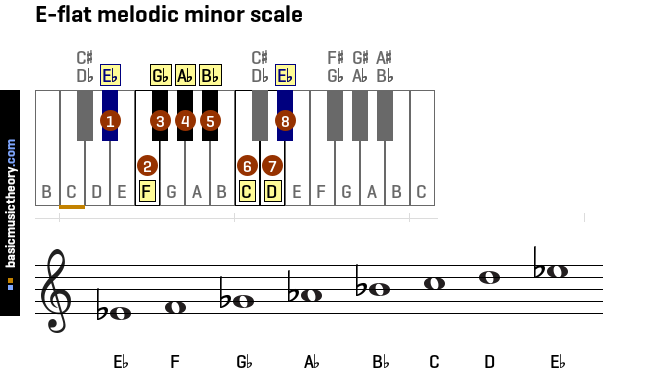 The G melodic minor scale has 1 flat, 1 sharp. This is a commonly used minor scale key - G minor on circle of 5ths. 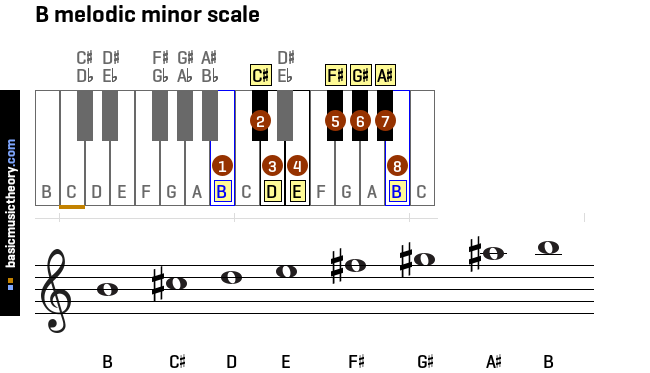 The G-sharp melodic minor scale has 5 sharps, 1 double-sharp. 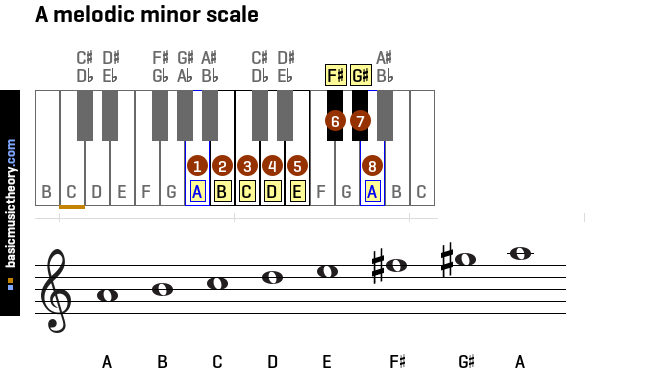 This is a commonly used minor scale key - G# minor on circle of 5ths. The A-flat melodic minor scale has 5 flats. This is a commonly used minor scale key - Ab minor on circle of 5ths. 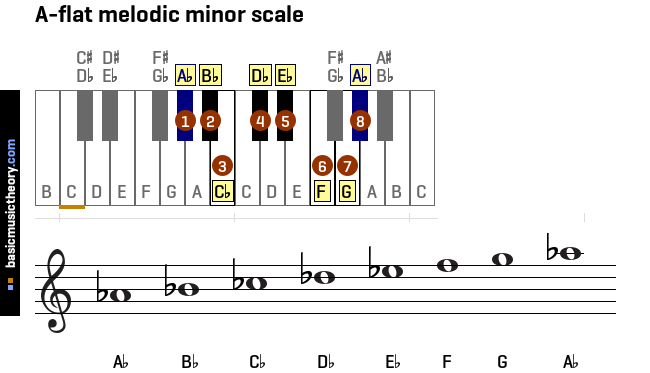 The A melodic minor scale has 2 sharps. This is a commonly used minor scale key - A minor on circle of 5ths. 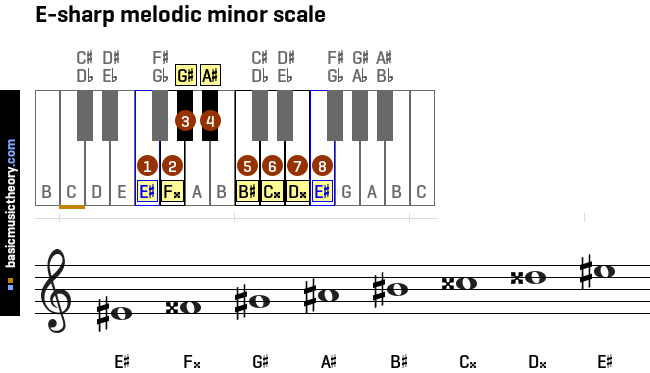 The A-sharp melodic minor scale has 5 sharps, 2 double-sharps. This is a commonly used minor scale key - A# minor on circle of 5ths. The B-flat melodic minor scale has 3 flats. This is a commonly used minor scale key - Bb minor on circle of 5ths. 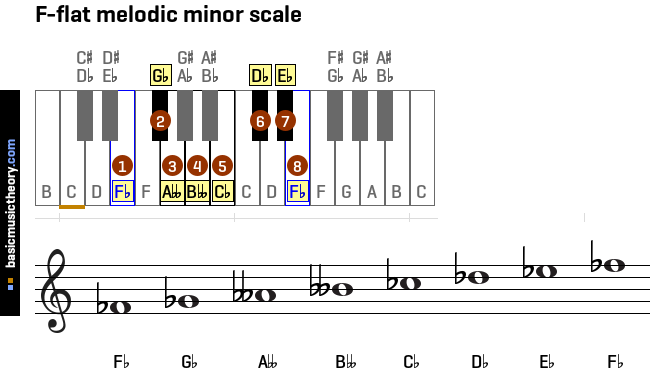 The B melodic minor scale has 4 sharps. This is a commonly used minor scale key - B minor on circle of 5ths. 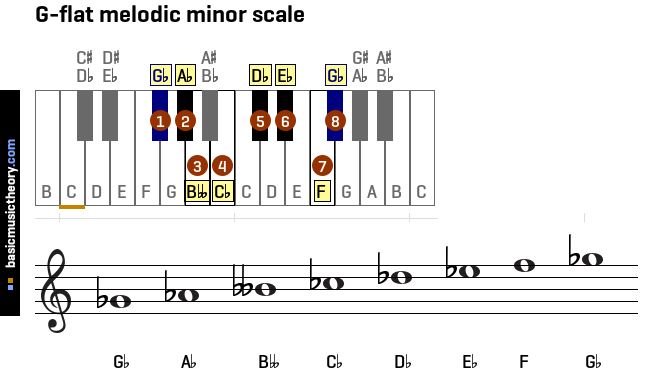 The B-sharp melodic minor scale has 3 sharps, 4 double-sharps. 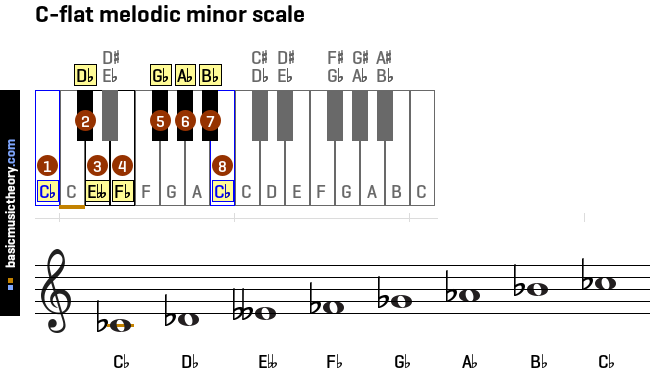 Warning: The B-sharp key is a theoretical minor scale key. The C melodic minor scale contains the same note pitches, is easier to work with, and is a direct replacement. The C-flat melodic minor scale has 1 double-flat, 6 flats. Warning: The C-flat key is a theoretical minor scale key. The B melodic minor scale contains the same note pitches, is easier to work with, and is a direct replacement.